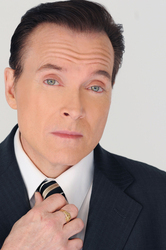 Billy West is an American voice actor. Born in Detroit, but raised in the Roslindale neighborhood of Boston, Massachusetts, Billy launched his career in the early 1980s performing daily comedic routines on Boston's WBCN. He left the radio station to work on the short-lived revival of Beany and Cecil. He was also a writer and castmember on The Howard Stern Show during the early to mid 1990s, where he gained nationwide fame with his impersonations of Larry Fine and late Cincinnati Reds owner Marge Schott. West is best known for his voice-work on Ren & Stimpy, Doug and Futurama. His favorite characters are Philip J. Fry (Futurama) and Stimpy (Ren and Stimpy), both of which he originated. West's most notable film work was in Space Jam (1996) providing the voice of both Bugs Bunny and Elmer Fudd. He has provided the same voices for other Looney Tunes films and video games. West has been very outspoken over his displeasure about the influx of movie star actors providing voice-over for films and major shows. West is also a guitarist and singer-songwriter with a band called Billy West and The Grief Counselors.